Rustic Ceiling Fans (2019) - Top options for your home. Rustic Ceiling Fans (2019) – Top options for your home. All things ‘rustic’ have been trending for a number of years, and it’s no different in the world of ceiling fan. Rustic ceiling fans shouldn’t be confused with ‘antique’ or ‘retro’ ceiling fans. Although these terms are often interchangeable, ‘rustic’ usually applies more to the materials used and overall finish than shape or design of the fan. So, you can get an antique design fan, or a retro shaped fan, but the materials, finish and texture will determine whether it appears rustic or not. Words of advice: rustic doesn’t have to mean shabby. Ceiling fans need to be durable and effective, but they can have a rustic look. If someone tries to sell you an obviously worn and shabby fan and pass it off as ‘rustic’, move along swiftly. There all plenty of designer – rustic ceiling fans available – they’ll give you the rustic look you’re after, but with all the convenience of remote control and warranties. 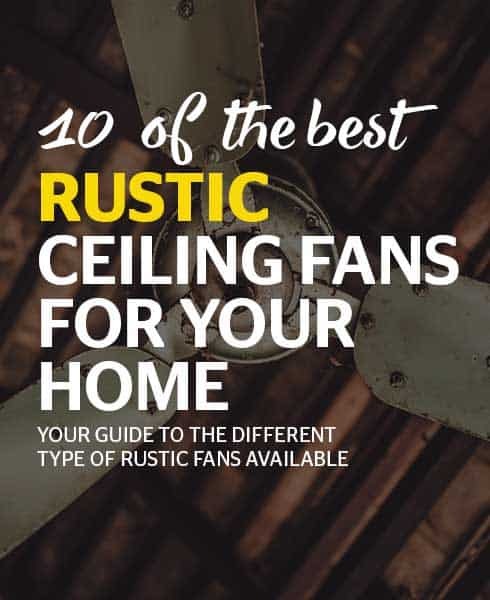 With rustic being such a popular look, it’s possible to find rustic options in nearly every conceivable category of ceiling fans from small household fans, to commercial, outdoor and even medium-size industrial fans. Below we have compiled a list of commonly sought after rustic ceiling fans along with one or two reviews of the top rated ceiling fans in that style to help you get started with your search. For the purpose of this article, ‘traditional rustic’ refers to the most common shape (central hub with fan blades) with a rustic look. There are endless options to choose from and the charm lies in the rustic detail of each individual fan. The 7800000 Brentford 52-inch Aged Walnut is a classic rustic ceiling fan that can be used either indoors or outdoors. It is ideal for industrial-style living rooms, old-school offices, or even stylish workshops. The center hub is made of seeded glass ensconced in a sturdy metal hub with and aged zinc finish. The six broad fan blades are made of rich Walnut with darkened edges giving them a slightly burnt look, which is a beautiful rustic detail. Despite its rustic appeal, this Brentford ceiling fan is equipped with all the modern accessories such as three fan speeds, a lifetime motor warranty and a two-year warranty on all other parts. Rated for outdoor use, this rustic Brentford is the perfect addition for a laid-back outdoor patio. This Hunter Fan Company 53029 Vernazza 52-inch ceiling fan is a striking combination of brushed metal in a dark cocoa hue and five squared-off blades in Aged Barnwood. The center hub is finished with old-school scalloped embellishments and has a single light enclosed in opaque glass. The 53029 Vernazza can be installed either with or without the light fixture and its three speeds are adjusted via a rustic pull chain. The beautiful dark blades are coated with Hunter’s patented Dust Armor, which reduces the risk of dust collecting on the fan. The Hunter features reversible airflow and the manufacturer guarantees minimal noise and that this fan will remain wobble-free. This no-frills rustic-style ceiling fan is designed for large rooms up to 485 sq. feet and slots in with most modern décor trends. The decadent Hunter 20551 52-inch Rustic ceiling fan is also part of the Vernazza collection. Although it’s a traditional shape with a center hub and five blades, the Hunter 20551 is ideal for those who want a rustic fan with a bit of flair. The large central hub/motor housing is decorated with delicate swirls all finished in the same Brushed Cocoa as the rest of the center hub. The center hub tapers in sharply where the five Aged Barnwood blades are connected via sculpted metal Brushed Cocoa arms. Right beneath the blades, the center hub once again flares out into a cloudy light housing that perfectly finishes off the rustic look. This fan is the perfect combination of rustic with a little bit of opulence and fits in perfectly with a more romantic design style. In typical Hunter tradition, this ceiling fan comes with all the necessities such as the company’s trademark Whisper Quiet performance, variable speeds and a CFM rating of 4820. If you’re looking for an understated rustic effect, the Kichler 300117DBK Canfield, is an excellent choice. This 52-inch ceiling fan features a Destressed Black metal hub with five paddle-shaped blades in dark Walnut. With few embellishments, the Kichler’s rustic appeal lies in the combination of distressed metal and the wood grain detail on the blades. Although this fan does not come with a light fitting as standard, customers can choose to add a light kit as well as remote control functionality. The standard version has three speeds and is operated via pull chain. The Kichler has a no-fuss rustic look that will appeal to those who don’t want to make their ceiling fan a focal point but also want a fan with a bit more character than a modern all-plastic option. A popular choice for people looking to create the western, saloon feel to their decor. Options are not plentiful given that it is somewhat niche, however, there are a few different options to choose from. Our selection of ‘sculpted rustic’ ceiling fans mostly have the same rustic trademarks such a brushed metal and aged wood, but they tend to have a more flamboyant design than those listed in the ‘traditional’ category above. These rustic styles will appeal to those who want a more whimsical design, but without the glitz or sparkle. They’re perfect for rooms where you want to include a beautiful ceiling fan, but don’t want it to steal the show. The Concord 52FEB5RI rustic ceiling fan is a masterpiece of detail, delicately fashioned blades and rustic metal. The Concord’s metal center stack / down rod is made of black distressed metal, but around the motor housing, there’s an intricately carved leaf pattern with and Amber (Rust) stain solidifying this ceiling fan’s rustic appeal. The Concord’s five blades are made of wood that’s expertly carved to look like large fronds swaying in the breeze. The eye-catching blades are finished in in the same Amber (Rust) stain as the leaves carved around the motor housing. This fan is full of quirky, rustic appeal and lends a tropical feel to kitchens, bathrooms or covered patios. It will even lend a lot of character to an entrance hall. This quirky rustic Concord ceiling fan has remote control functionality and comes with a one-year manufacturer warranty. The Nassau 52-inch Ceiling Fan features sculpted ‘leaf’ blades all finished in a spectacularly rustic Natural Iron. The Nassau adds some metal attitude to the leaf-shaped blade trend by shunning the ‘natural wood’ look and instead casting everything in distressed iron. The design may be a little whimsical, but the iron finish ‘toughens up’ the entire look. The term ‘steampunk’ comes to mind, but without being too elaborate. The Nassau features five blades, three speeds and has a wet rating making it ideal for covered patios. The optional light kit consists of a single downlight that perfectly complements the Nassau’s rustic appeal. This is the perfect ceiling fan for those who want a rugged, rustic look. The fans featured in this category get their rustic character more through the use and texture of wood rather than metal. The use of different stains, textures and wood grains are used to create beautifully rustic ceiling fans with loads of character. These fans are ideal for those who want a more natural rustic look to complement their choice of décor. The Gulf Coast Venetian Tropical ceiling fan is fun and eye-catching with a distinctly rustic feel. This ceiling fan has a central light with clear glass, giving it a more ‘airy’ look than most rustic finish fans. Similar to the Concord, this Gulf Coast Venetian’s most striking feature are the five blades sculpted to resemble large palm leaves. This fan earns its rustic status due to the fact that the blades have an authentic driftwood finish. Light in color with minimal use of metal finish, this Gulf Coast ceiling fan will add some natural rustic charm to any space. At-52-inches this is the ideal fan for spacious bedrooms or smaller living areas. It’s got all the rustic appeal you’re looking for but forgoes the traditional dark wood and brushed metals that characterizes most rustic fans. It’s a unique choice. This Minka Aire F701-DRF Driftwood ceiling fan is a study in natural, rustic elegance. The Minka Aire’s style and shape is similar to those listed under ‘traditional’, but its Driftwood finish earns it a spot on the ‘wooden rustic’ list. With few embellishments, the Minka Aire F701-DRF Driftwood ceiling fan is elegant and understated with the Driftwood finish giving it a natural rustic character. This 52-inch five-blade fan is ideal for seaside homes or coastal-inspired décor. It has adaptable speeds, a lifetime warranty and a CFM rating of 5600. Similar to the Minka Aire, the Glacier Bay 52-inch rustic ceiling fan earns its place on this list due to the beautiful wide blades with a woodgrain finish. The center hub is a tasteful brown copper that perfectly complements the paddle-shaped blades with their light brown wood finish. The Glacier Bay ceiling fan is rated for both indoor and outdoor use and is operated via a pull chain. It features a single downlight that is operated via a separate pull chain. The Glacier Bay is a beautiful combination of bronze and light wood where all the detail lies in the texture of the materials used rather than carvings or embellishments. The Monte Carlo 5GL52WI Great Lodge ceiling fan is the ultimate carved wood rustic accessory. As its name suggests, this fan will look right at home in a hunting lodge, rustic pub or a cabin in the woods. The center hub is fashioned to resemble a cut wood round and the detail on the five blades are styled to look like saw markings. The blade arms are done in either Distressed Black or Iron finish and the ends are carved to resemble pinecones. The center hub also tapers off into a tiny pinecone design. This Monte Carlo Great Lodge has a distinct ‘Bear Grylls’ outdoors look and it doesn’t get any more natural rustic than this! With three-speeds operated via pull chain and a limited lifetime warranty, this rustic creation pays homage to the rustic beauty of the forest. It’s probably an acquired taste, but it will definitely be a talking point. Having extra illumination built into your ceiling fan can sometimes kill two birds with one stone. You may not need to have a separate light and ceiling fan fixture. More often than not if your ceiling fan does not come equipped with an integrated light kit then you may be able to purchase a separate light kit. It may not always be the case especially in the scenario you are looking at a really unique, custom design ceiling fan. If you do not see an integrated light kit on a particular rustic ceiling fan you may be looking at, search for the model and “light kit” or just ask the seller or manufacturer. If you are wanting to be as energy efficient as possible, be sure to check what sort of bulbs a ceiling fan takes. Not all rustic ceiling fans with lights have LED bulbs and sometimes the older bulbs can be a bit problematic with a number of replacements and sometimes, obscure bulb types. One candidate for the best rustic ceiling fan with lights is the Hunter 52225 Casual Donegan Bowl Light Onyx Bengal Ceiling Fan With Light. This particular fan comes packed with up to the minute features. Variable speed enables you to run the fan at a speed that is right for you, not at pre-set levels. Two 9.8W LED lights ensure that you have adequate lighting as well as being highly energy efficient. Not only that the lights have a dimmer feature, so you have full control over the lighting output. A 3 position mounting system allows for standard, low and angled mounting. With a reversible option, you are able to use the fan all year round to help heat and cool your home. In the reverse scenario where you might be looking for rustic ceiling fans without lights chances are you will be able to purchase your ceiling fan without a light kit, or at the least remove them. Of course this does not apply to the ceiling fans which have their lighting integrated into the design. There are not a huge amount of Western ceiling fans available but the ones that are are very cool. They are custom made and have a very unique and handmade feel to them. You can get various custom designs made for you. Check out our post on Western Ceiling fans. Another very popular rustic style ceiling fan people are looking for is Antler ceiling fans. The thing is, the ceiling fan is not made from real antlers. If it were the fan wouldn’t work very well! In fact, the antler fixture comes in the form of a lighting kit for various models of fans. So if you were looking for an antler style ceiling fan check out which companies make the light kit and look for the ceiling fan that is compatible. If you have been searching for rustic ceiling fans you have probably seen windmill style ceiling fans at some point. As mentioned above, the windmill ceiling fan is a perfect fit for as a farmhouse ceiling fan or as a unique feature piece to complement your rustic decor. Quorum is the company that makes the popular windmill style ceiling fan. They make this particular fan in a number of different sizes so be sure to check the size and choose one that fits your room. Rustic ceiling fans may look a little, well, rustic, but these are still modern appliances and they need the same care and maintenance as any other fan. You may not be able to see dust build-up as easily as you would on an all-white ceiling fan, but they need to be cleaned just as regularly. Regular dusting and making sure there is no build-up in and around the motor will keep your rustic beauty in good nick. It probably goes without saying that due to the various textures and purposely-created rustic look, you don’t want to tackle these fans with a can of polish – that’s likely to ruin the slightly faded look. Your first reference should be the owner’s manual, but quite often a damp cloth is all you need to remove any stubborn dirt. As mentioned, rustic fans are very fashionable at the moment, and they’re available in most popular fan sizes. It only gets tricky when you’re looking for heavy-duty industrial sizes, as these aren’t normally styled for fashion, but rather for function. If you’re unsure what size ceiling fan you need, the best option is to ask the experts – speak to someone at your local store or contact the manufacturer for advice. Although oversize fans are trendy, you don’t want to be completely overwhelmed or kick up a small hurricane even on the lowest setting. Large fans are generally designed for large spaces, but the number of blades, as well as their angle, makes a difference in the wind speed. Naturally, there is plenty of information online, but it’s still safer to speak to those in the know – they may have some excellent advice in adapting your rustic ceiling accessory to suit the size of the room. Rustic not for you but looking for something a little different? Why not check out our mega list of unique ceiling fans!